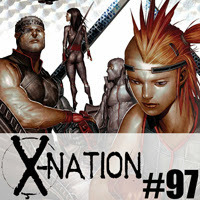 In this episode of X-Nation, Paul reboots Antony's systems with a surprise kiss. Then they join Magneto on a manhunt. Oh, and they also discuss the Month in X for March 2014! Month in X - March 2014 - Origin II #4, Wolverine #3, Magneto #1, X-Force #2, All New X-Factor #4, All New X-Factor #5, X-Men Legacy #300, Marvel Knights X-Men #5, All New X-Men #24, Guardians of the Galaxy #13, Uncanny X-Men #18, Uncanny X-Men #19, X-Men #12, Amazing X-Men #5, Wolverine and the X-Men #1, and Wolverine and the X-Men #2.